TandemThings: Mojo lost? Mojo found! Having successfully completed the Davis 300 on Dobbin we weren't too concerned about the thought of undertaking an even longer ride on our touring tandem - even though this would be twice the distance of anything we'd put him through prior to this season. Perhaps bearing more on our minds was that this was the longest ride we'd done in quite a while - since Easter last year in fact, when we'd made a failed (non-validated) attempt at a team "arrow" to York. With the distractions of moving house (and continent) in the second half of last year we'd fallen right out of practice in the whole long-distance part of randonneuring. So in ways entering a 400 felt once again like the longest ride we'd done since PBP in 2011. As with the 300, we decided to stay over in Davis both before and after the ride, so as to make the 6am start a litte more agreeable, not to mention to avoid the need to drive in the small hours. The ride started promptly, and soon we were battling our way out East once more, through the same Northerly cross wind as 4 weeks before. Thankfully it was not quite so strong this time (or, maybe we were becoming accustomed to it), but equally we failed to make quite such an effective rotation of riders so by the time we reached Putah creek just East of Winters we were ready to sit up and ride our own pace for a bit, even with the tail wind. This was also a good chance for a stop to remove arm warmers and swap to dark glasses, as already by 8am it was starting to heat up into a warm day. It made a very welcome change to skirt south around the Lake Berryessa mountains rather than right over them, instead visiting the 'burbs of Fairfield and then heading North up Wooden valley. Here we repeatedly passed and were passed by a large group of Leukemia Trust cyclists out on a training ride. We softly chuckled about the three rest & refreshment stations we saw setup for them along this 40km stretch, quietly thinking to ourselves how we'd already done 60km before meeting them and had yet to reach our first refuel station -- not to mention the 300km we'd still have remaining to ride after parting company. Part we did, as we turned onto familiar roads that lead up and past Lake Hennessy and then drop into the Napa valley, Silverado trail. The Northerly wind had abated somewhat by now, so we really able to enjoy the scenery as we cruised to Calistoga, passing by many sights we'd enjoyed a fortnight before while touring the area with my brother and his family. The Calistoga control marked 160 km of the ride, but somehow felt further -- the turn around point at Lake Sonoma now seemed well within striking distance, and everything was feeling great. The heat of the day was really starting to get going as we skirted around what felt like 3 sides of Healdsburg and found the county road to our lunch stop. This is a beautiful part of the area we'd not seen before, somewhere worth spending time in "Wine Country" without quite the maddening crowds (and continuous bachelorette limousines) of Napa county. 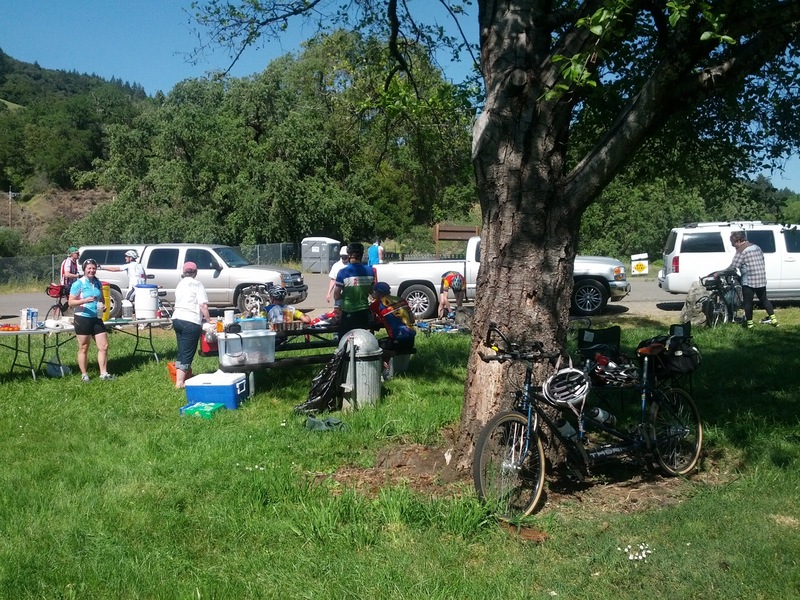 We took our time at the control, really enjoying the third fully catered rest stop laid on by Dan Shadoan and his excellent team that are the backbone of the Davis brevet series. The return trip started very slow, even on flat lands and with the wind technically (if not noticeably) behind us, we were full of food and feeling the mid-afternoon furnace. What a difference 6 months makes though - last time we experienced this extreme heat, I really suffered, but this time we were well stocked with drinks and better protected with white clothing, so taking it steady, just keeping on moving, and eventually we were on the climb back out of the Alexander valley and into Calistoga. The next stage had a couple of climbs, back to Lake Hennessy, and "past the winery" as we've come to know it, and would also see dusk, so we kitted up for night riding and welcomed the relative cool of the evening. By Moscowite corner several of the other riders we'd be riding around the same pace of, and enjoying company of in each control, were looking a bit sleepy, and indeed a bit of a lie down and even a small beer was welcomed by several as we enjoyed the comfort of the first indoor control of the ride, and perhaps since moving to California! Emma and I were still feeling pretty good at this point, so pressed on without too long a stop, eager to get to and beyond the final control point. I don't think either of us realized at this point we still had our best cycling legs to come though! As real darkness fell, the indomitable climb to Cardiac Pass seemed, well, a little more domitable than usual, and so soon we were screaming down the other side enjoying the biggest decent of the ride. So we surprised ourselves by rolling into the 7-11 corner shop in Vacaville just about midnight. A hot cup of coffee or chocolate and a snack later, and we were soon heading out on the final stretch, with the words of the store keeper still in our ears: "you'll do well to get to Davis by 4am"! So looking back this was the strongest finish we'd made in a while, and it felt just great to get to the end of the ride with enough in the tank for a (very short) sprint, and generally feeling like yeah - we could probably cycle a bit further than that. A relatively flat route, great weather, pacing ourselves in the hottest parts of the day, and mostly enjoying our time on the bike, all helped to make it feel like we were really back and riding strongly again - if not quite at the same level as 2010 then certainly back where we were entering PBP, and that's a great feeling.